For the upcoming Only Watch 2013 event, Vacheron Constantin have created the Patrimony Traditionelle World Time; a piece representative of their patronage of the applied arts, with no less than three artisan crafts employed in its make up. World Time watches offer the ability to indicate time in locations around the world instantaneously, and although this piece offers instant time reading in 36 locations plus the reference time it does so whilst remaining useable, uncluttered and elegant. Acclaimed enamelling artist Anita Porchet brings to this exceptional watch the skills she has learned since childhood and her extraordinary patience. Her hand-crafting is showcased on the gold central dial which displays a map of Europe created using the technique of champlevé enamel resulting in a translucent, milky exquisiteness for both land and sea. Monaco, the location of the Only Watch auction receives its own tribute, highlighted with the vibrancy of red on the city ring and with a round-cut diamond on the map which is fixed into such a slender plate that its gem-setting presents its own degree of difficulty. The dial is comprising of four parts. The central gold section, the metal ring displaying 36 locations plus reference city, a sapphire 24-hour display with day and night indication and a metal outer ring with painted minute circle and applied hour-markers. Such a mechanism should be complicated to use, but Vacheron Constantin have simplified its functions so that all adjustments are made using only the crown. Inside is the mechanical self-winding Vacheron Constantin calibre 2460WT with power reserve of 40 hours. 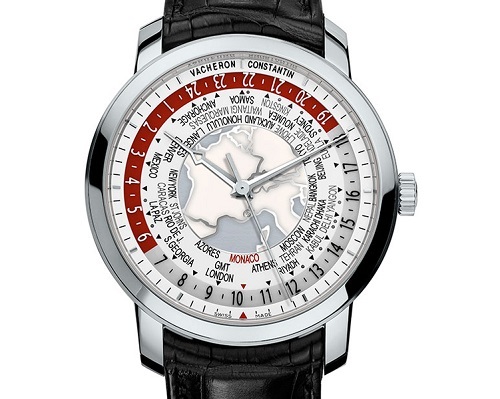 The Vacheron Constantin Patrimony Traditionnelle World Time Only Watch 2013 edition is housed in a 42.5mm platinum case with an engraving on its rear confirming its Piéce Unique status. My introduction to the Only Watch 2013 Auction can be found here. The Corum Golden Bridge Ceramic (and a look-back to where it all began). Sinn U200B - Fine, Dapper (... and tough as old boots).